What Mystery Missile Launched Off California's Coast Yesterday? Someone launched a missile off the southern California coast Monday night, but neither the Pentagon nor the Navy will claim credit for the rocket launch. So what is it? Where was it going? Video of the mystery missile below. Update. UPDATE: The FAA confirmed to Jalopnik that there were no commercial launches planned for that time and an employee of SeaLaunch told us they didn't carry one out on Monday. 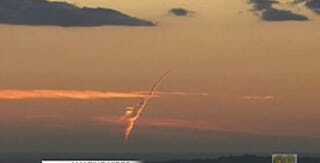 One theory is that the missile isn't a missile at all, but rather an optical illusion created by the contrail from a jet traveling across the horizon. The military is still investigating.